Yard Sale Listings is a FREE service! Yard Sale Listings is designed to be used in conjunction with your newspaper classified and other print advertisements. You can search by Zip, OR you can search by State and City. There are ( 66 ) Yard Sales and ( 77) Items Listed! Would you like to list yours? SELLERS: List as many items as you wish, FOR FREE -- complete with detailed directions to your house without incuring additional line costs in the print advertisements. BUYERS: Search for Yard Sales near you, or for a particular item that you might be looking for. 2. List your Yard Sale - Phone number, directions - anything. 3. List as many items in your Yard Sale as you like. 4. Set up advertisements in newspapers, etc, referencing your web site. Email Address Password Not a Member? This Weeks Featured Items at MINISTRY MART! 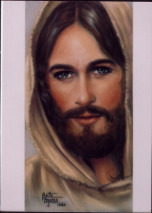 A beautiful print of the painting of Jesus inspired by a miracle in Mrs. Myers life. Available in Wallet, 4 x 8, 6 x 12, and 8 x 16.